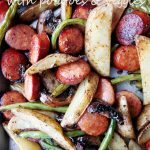 Sheet Pan Andouille Sausage with Potatoes and Veggies – Deliciously seasoned andouille sausage, potatoes, and veggies, all prepared in one pan and ready in just 30 minutes! Hi Hi! Happy Monday! It’s sunny, it’s bright, and March is only 2 days away, which means Spring is finally here! I know, I know. Spring starts on March 20, but let’s not get technical, m’kay? This post is sponsored by STAR FINE FOODS,! Thank YOU, friends, for supporting the brands that make Diethood possible! I should just move to a year-round warm spot and never think, or talk about another winter, coat, or boots, or long johns… ever, again. 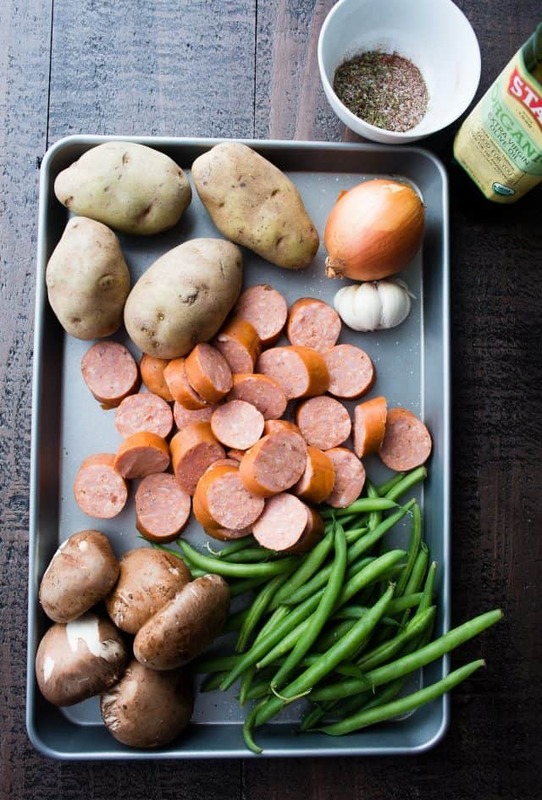 On the plus side, I spy a ONE sheet pan andouille sausage dinner that wants to be in yo’ life! AND I think it’s better enjoyed in, dare I say, chilly weather. It’s warm, it’s pure comfort, and it is so, soooo, soooo good! You’ll see. The best part of this isn’t even the sausage or the taters. It’s the seasonings! A mix of thyme and oregano and paprika all combined with a nice amount of our favorite STAR Organic Extra Virgin Olive Oil. The reason I was compelled to make this in the first place is because I had some andouille sausage leftover from when I made that Chicken and Sausage Gumbo. After some thought on how to use up the rest of them sausages, Mr. Star Organic here caught my eye, which led me to visions of rich and toasty roasted veggies and extra flavorful andouille sausage. 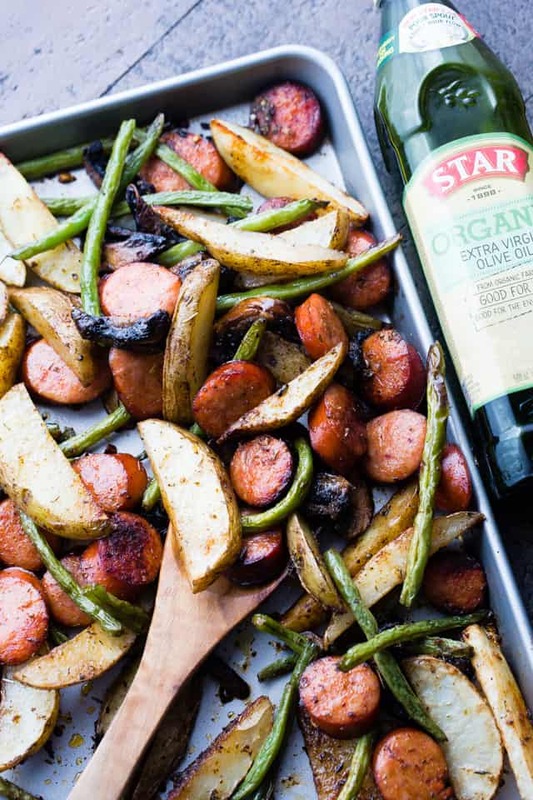 STAR Organic Extra Virgin Olive Oil, with its rich fruity olive taste, adds a hint of flavor to this sheet pan meal, and it’s also made from organic olives harvested and processed to maintain organic integrity that meets all the standards of the USDA Organic Program. For starters, we’re going to cut up a few potatoes into thin wedges, slice up the baby portobellas, as well as the sausages, and trim them green beans. You’ll toss all those pretties up with the olive oil + seasonings mixture, throw that on top, mix the veggies around using your beautiful hands (utensils will do), and impatiently wait for the finished product because it looks awesome and it IS awesome. You’ll be all googly-eyes over your winning meal of delicious, filling, and mostly-healthy Sheet Pan Andouille Sausage with Potatoes and Veggies. 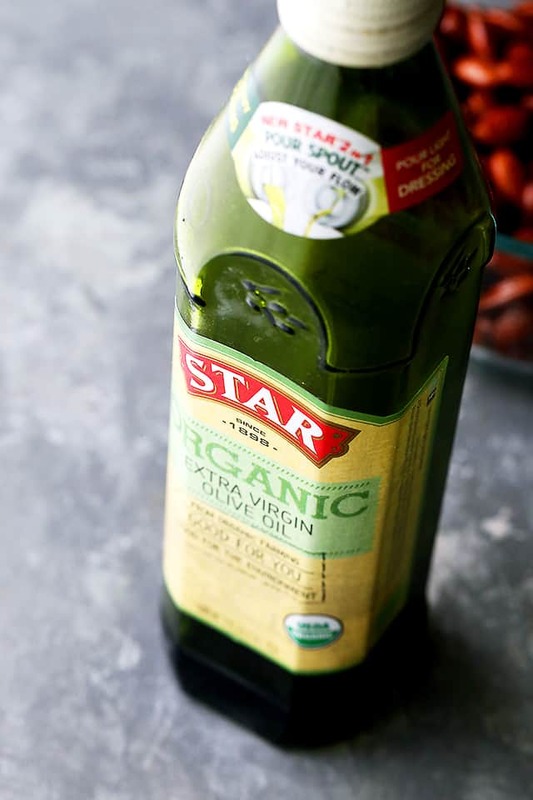 STAR Organic Extra Virgin Olive Oil – STAR Organic Olive Oil is available at select Walmart Stores and ONLINE. 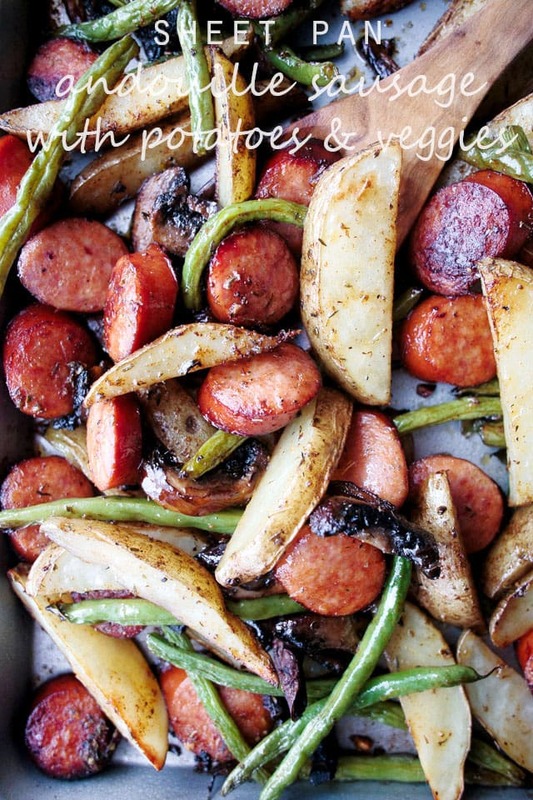 Deliciously seasoned andouille sausage, potatoes, and veggies, all prepared in one pan and ready in just 30 minutes! 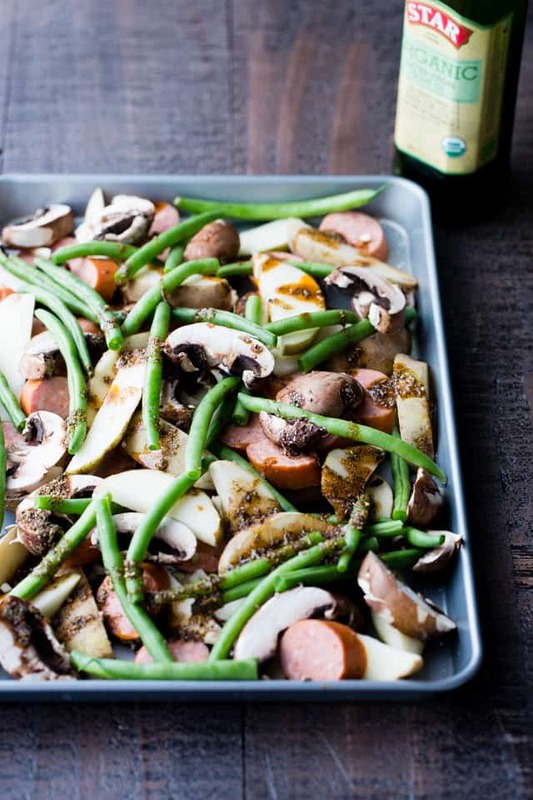 Line a large sheet pan with foil and arrange the prepared potatoes, sausages, mushrooms and green beans in it; set aside. 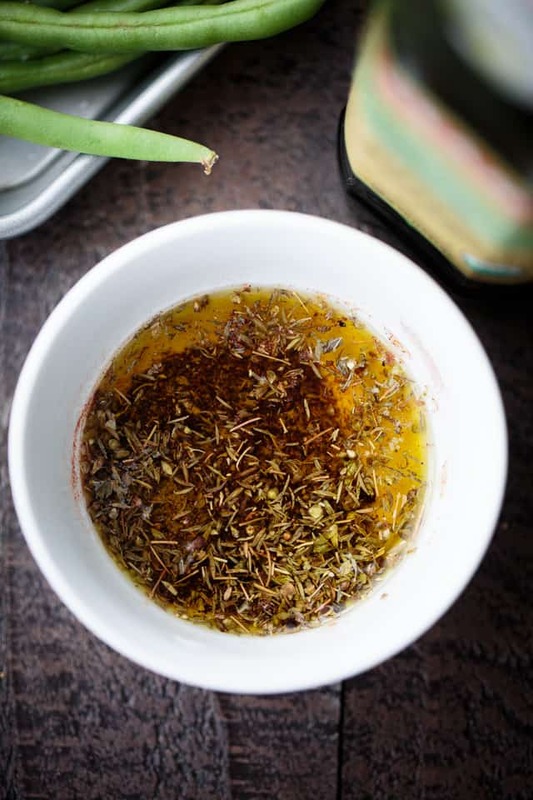 In a small mixing bowl whisk together thyme, oregano, paprika, garlic powder, garlic, salt and pepper; pour in the oil and continue to whisk until thoroughly combined. Pour the seasoning mixture over the previously prepared veggies and sausages; toss everything together until well incorporated. Roast for about 30 minutes, stirring once or twice, until the vegetables are tender and potatoes are done. Do you use sweet or smoked paprika? I just love sheet pan meals and make them all the time. Trying this one soon! My husband and I cooked this last night as our first “homemade, team” meal!! We just remodeled our kitchen and we’ve been VERT ready to ditch the takeout. It was delicious. We added smoked beef sausage and removed the mushrooms.. This recipe is a keeper. It was very delicious. Even the katsup only on the burger teenager cleaned his plate!! Looks simple yet amazing! Ready for spring here, too!! This looks so easy and that is perfect for busy school nights. I love oven roasting veggies! Throwing some sausage on too can only make it even more tasty! YUM! What a combination! As someone who just adores andouille, I love the idea of turning it into a sheet pan dinner. Brilliant! Love sheet pan dinners…easy clean up! My family will love this! So much deliciousness here! A perfect weeknight dinner! Mmmmm, this meal is a winner!! SO easy too! I can almost smell how good this is from here! I need to try this!